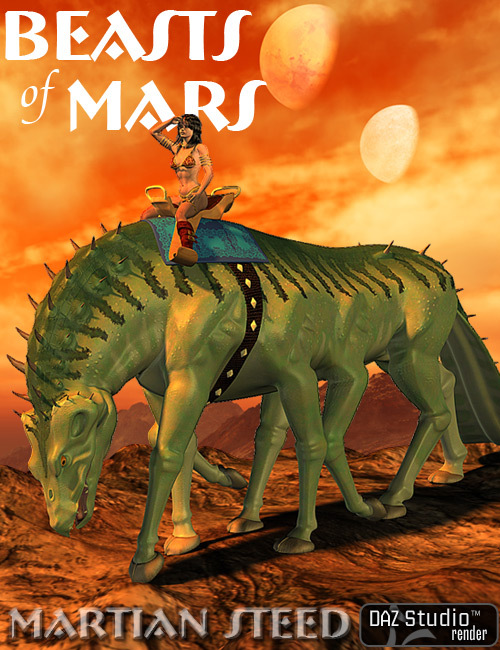 Part of the Beasts of Mars series: This swift and agile mount will carry you swiftly over alien terrain. General: Master ERC Dials to control overall body movement (specifically, the Neck and Tail) are located in the BODY of the figure, along with a few shaping morphs, such as hoof-shaping dials. Dials specific to the head (controlling both eyes together, for example) are located in the HEAD Body part, while the ERC dials for the tongue are located in the JAW body part. An optional conforming set of Spines is provided. Usage of the spines is entirely at the user's discretion. If desired, use this in conjunction with the 'SpinesBase' morph in the BODY of the Steed to provide a more realistic base for each of the spines. 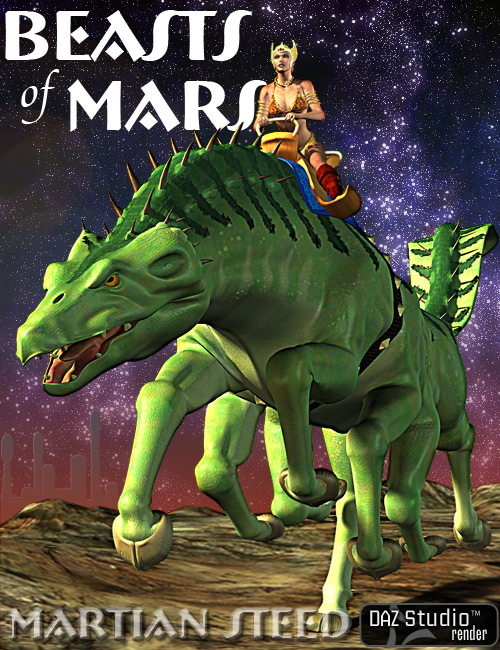 These instructions will assist in creating a fully 'loaded' Martian Steed, complete with spines, tack and rider. 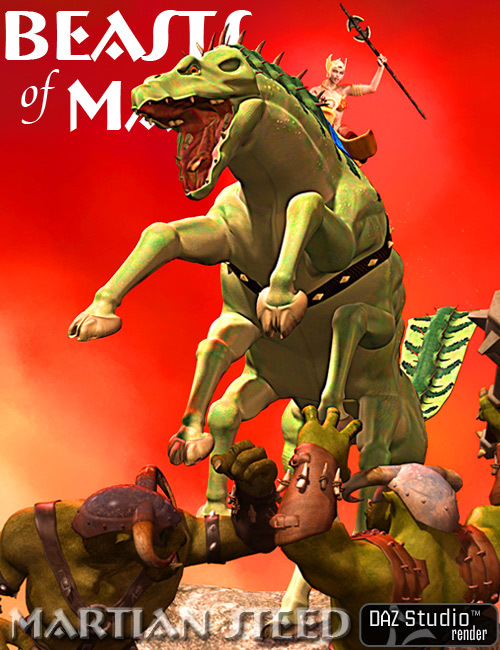 Pose the Steed figure, using a supplied preset or your imagination! DS Usage: Files (including Materials) should load correctly in DAZ Studio by using the Poser Library icons, with DAZ Material presets loading textures into their appropriate locations and settings. “And his mount! How can earthly words describe it! It towered ten feet at the shoulder; had four legs on either side; a broad flat tail, larger at the tip than at the root, and which it held straight out behind while running; a gaping mouth, which split its head from its snout to its long, massive neck. The narrator goes on to describe how the riders use neither bridles nor reins, but control their mounts through a sort of rudimentary telepathy. Martian animals are for the most part neither mammal nor reptile, possessing neither scales nor fur, and their feet are for the most part heavily padded and shapeless, possessing no nails, nor hooves or claws. Thus, complete accuracy may have led to a somewhat uninteresting figure for general use; so I used artistic license to add claws and scales to the default figure, as a matter of artistic interest. You will see that the hooves have a few shaping options available, from simple to cloven, claw-like or non-existent. There is an alternate MAT file provided, which eliminates the scales, spines and claws, thus recreating the authentic look of the Barsoomian thoat as described above, for those who wish to be completely accurate. 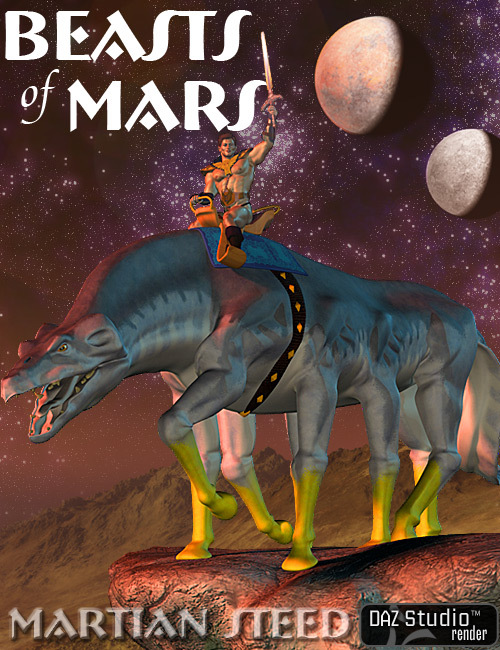 Obviously, however, the user is not constrained to use this figure in recreating scenes from the John Carter of Mars series. This figure can be used in any science-fictional setting, whether domesticated or wild! In fact, as an eight-legged steed, the figure can also probably serve in a fantasy/mythological setting as Sleipnir, the Norse god Odin's eight-legged mount.